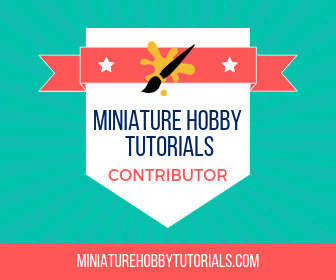 The post relates to the ongoing narrative campaign that is being run by my gaming group. All the missions used for the first phase use fixed forces and have clearly defined objectives. Two of us tested the missions before those whom had not seen the missions, prior to them being played took control of the forces. The campaign itself is based around a chaos invasion of the planet designated Mirum Ostentum. As we wanted to end the first phase with a battlefleet gothic > planetstrike combo, it was decided that the first phase chaos presence would be limited to alpha legion and their cultist forces. The alpha legion use the forge world legion astartes rules as a template for their forces, but with the addition of the chaos cultist unit from the chaos space marine codex. The Imperial forces are comprised of the Cadian 131st and Gallian 7th Imperial guard regiments. A blood angels company, a company of Storm Hawks space marines (Using the Space wolf codex), a black Templar crusade force, a mechanicum tagmata force (Using the 30k list). While there is a dark angels contingent on the planet, they are not known to the other defenders and have their own agenda. 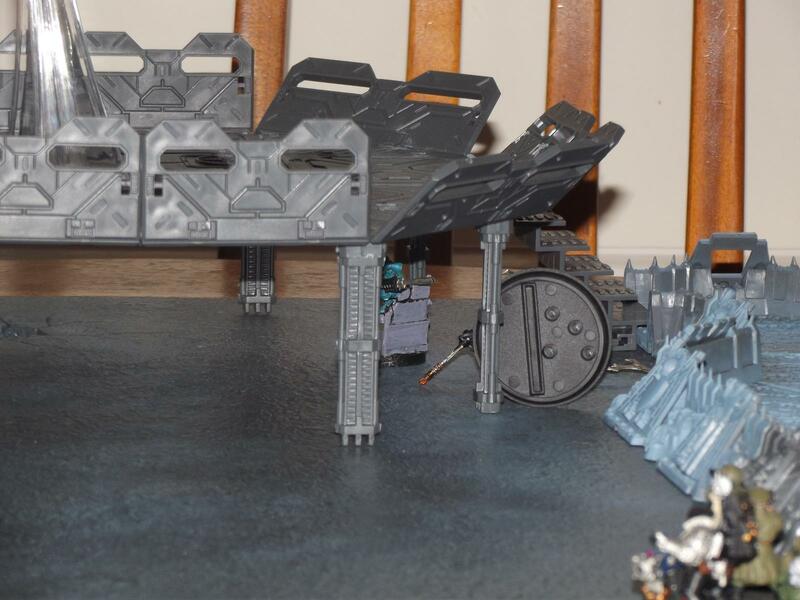 In addition, grey knight and deathwatch forces are available to the imperial side. Chaos forces gain chaos points, and imperial forces gain stockpile, which is used at the end of the first phase to enhance the forces present in the missions. With the groundwork now laid out let us proceed. 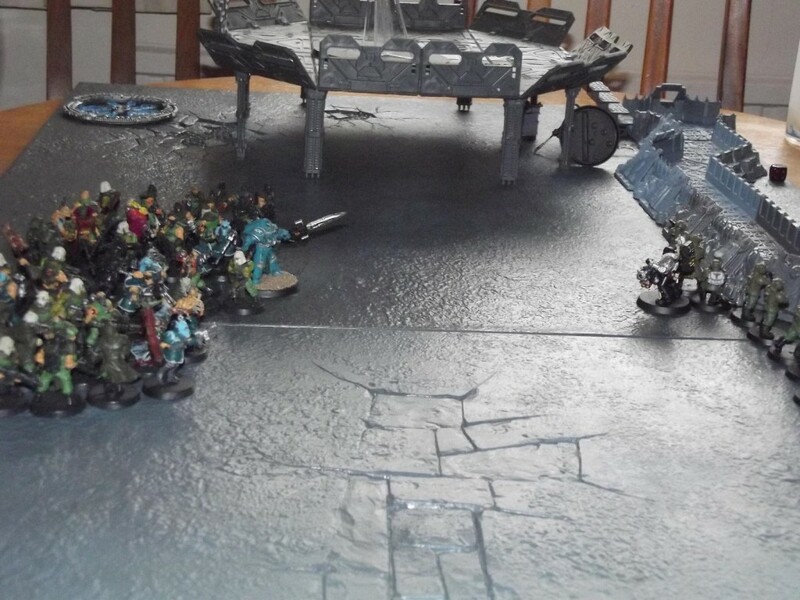 Having called a meeting and spoken with the available imperial representatives, as well as the Arch magos of the Helix Tagmata, the commanders of the Gallian 7th and cadian 131st guard regiments, as well as gaining the cooperation of the Blood angel and Storm hawk space marine companies present in the sector. Inquisitor Virgil Ditya has planned how they could prepare for the coming chaos fleet. 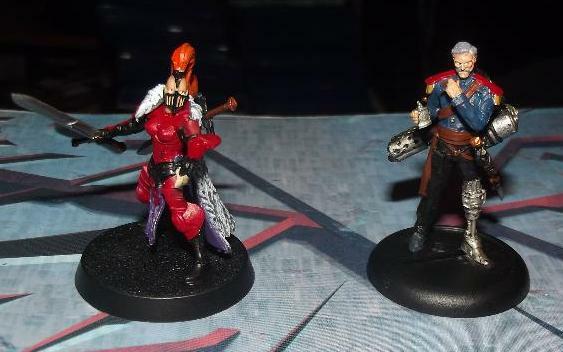 Inquisitor Virgil Ditya and his death cult assassin Hikari. 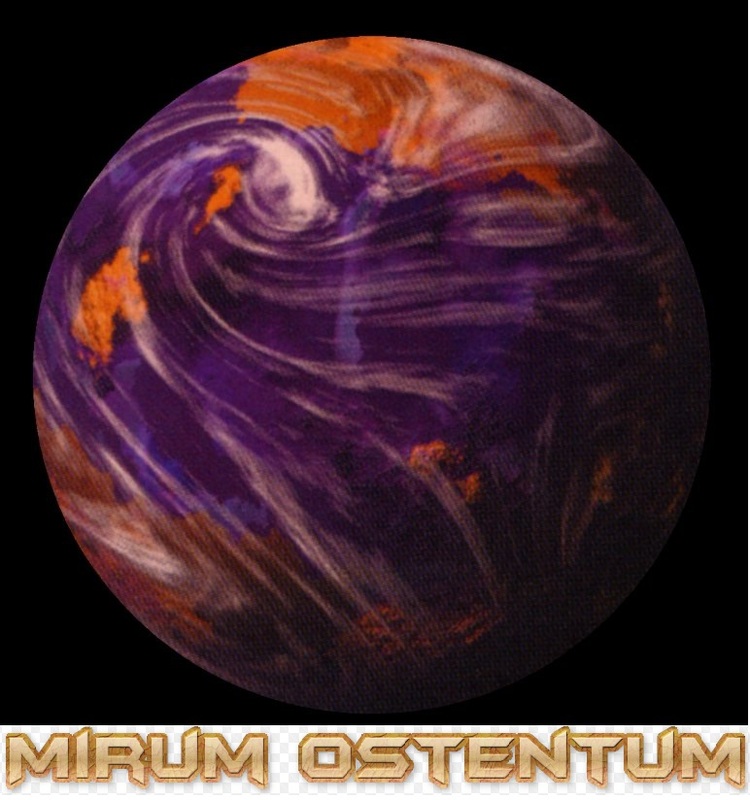 With his plans laid out, and relayed to the forces he has, the cooperation of he makes to head back to the planet’s capital a hive city called Altum. Unaware that Alpha legion forces have infiltrated the planet, and are working to undermine and disrupt his plans to reinforce the defences. But, first they will need to capture him alive. Exodus [attached to the recon squad. The squad and exodus have been given the hit and run USR for this mission] and Susurri an alpha legion preator armed with tartaros terminator armour, a paragon bade, power dagger, digital weapons and a volkite charger. We had tested this mission thoroughly and ended up with a 50/50-win rate between the forces. 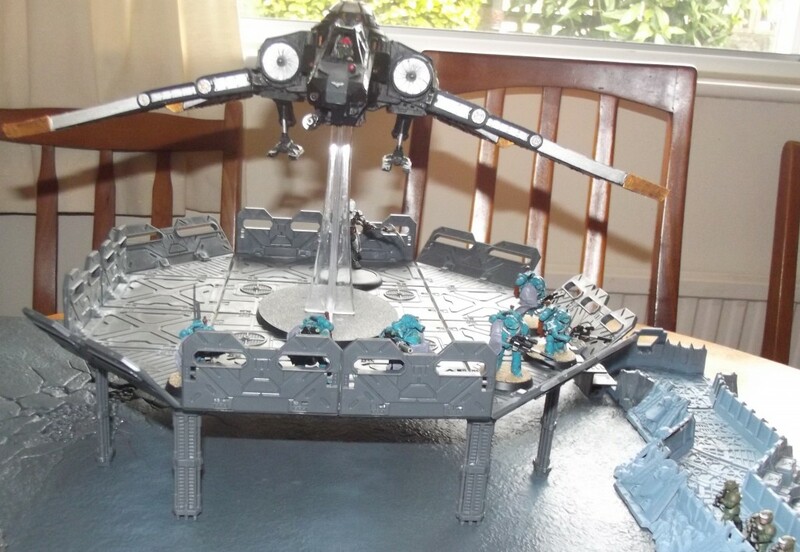 In this mission the imperial player needs to extract the inquisitor using the aquila lander, which when it arrives will hover on the landing pad. The penitent engine is placed touching the rear portion of the landers base and can charge on the turn it arrives. Exodus and his squad are deployed on the landing pad. 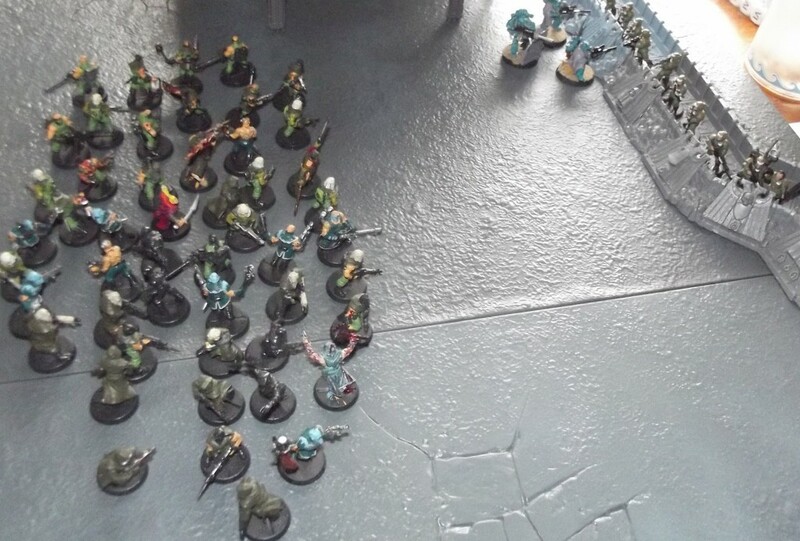 The imperial guardsmen are placed in the wall of martyrs trench network. 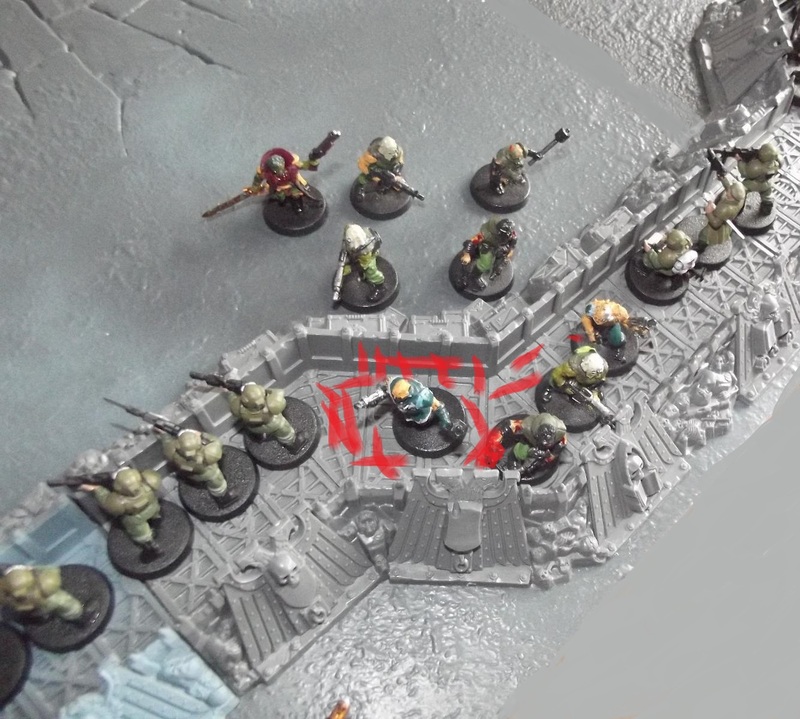 While the inquisitor and his death-watch squad are deployed in the zone mortalis tile which is acting as the bunker entrance. The first wave of cultists is deployed up to 3” from their table edge and each subsequent wave adds 3” to its first move when they arrive on the table. Imperial forces get the first turn. Private Scholl held his lasgun and looked out from the trenches. The barren landscape still suffered from the battles it had witnessed from before he was born. The landing pad nearby cast its shadow over them as the moon rose reflecting the light from the planets star over the area. Private Hale was sharing out what little recaff he still had left, and Scholl could swear he had mixed mud and engine oil into the damned stuff as it tasted horrible. Turning back to his task he continued to scan the environment. ‘Why me this fragging planet is dead why are we even out here.’ He thought to himself. A movement caught his eye as he sighted through the field goggles he had been issued with. He wiped the lens and checked again. Three gorgons and a mastodon transport moved through the mist, the camouflage added to their hulls making them difficult to see. The doors slammed open and a horde of lunatics poured forth. A single larger figure strode out into the mob from within the mastodon. The horde shifted to face him. The space marine wore turquoise armour that had been camouflaged by its owner. He drew his sword and pointed at the defensive line. The transports held position as the horde charged forward separating outwards into waves as it proceeded with the space marine following behind. Staring at the forces of chaos over no man’s land the guardsmen prepare to start firing. Only nine cultists make it to the imperial lines and they charge into and kill off the grenade launcher team. The aquila lander makes an appearance and drops the penitent engine onto the landing pad. 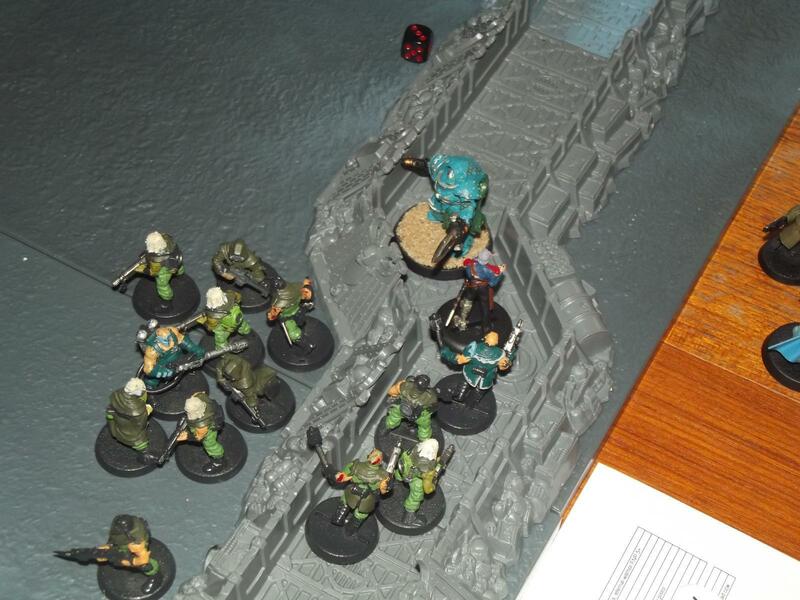 The second wave of cultists moves forwards as the alpha legion hit and run out of combat with the penitent engine having lost one marine to shooting and two in combat with exodus having taken a HP from the penitent engine with his power dagger. A combined charge from the cultists and the recon squad wipes out the infantry platoon that was nearby losing both recon marines, the cultists are then grilled by the penitent engine before it is taken out by Exodus moving behind it and shooting it in the back with the instrument. The cultists charge in and wipe out the remaining infantry platoon. Susurri having blocked the movement of the inquisitor had started chewing through the henchmen. The last remaining deathwatch marine moves in and fires his frag cannon at the cultists before he dies to cultist overwatch. The Alpha legionnaire cut down all before him as Virgil used his power sword to dispatch a handful of foes before his protective power field failed and he was beaten to the ground. Fire streaked upwards from exodus and from the mastodon as the Aquila lander soared off. A few shots clipped the fuselage but could not do any lasting damage. A Xiphon interceptor blasted overhead sending the Aquila spiralling downwards with a burst of missiles. The machine struck the ground with a satisfying thud. 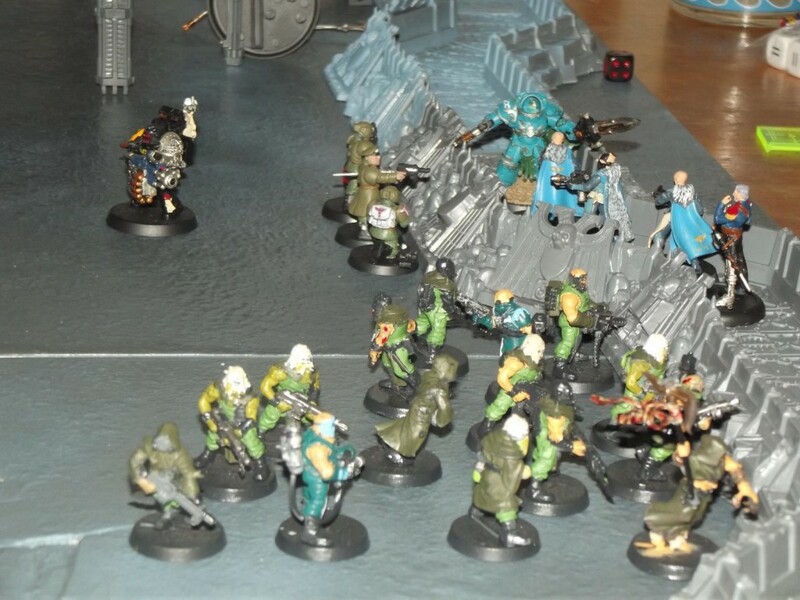 While the cultists under exodus’s order gathered up the dead deathwatch and alpha legionaires. Susurri looked over his captive. Virgil Ditya was bloodied and unconscious but he was still alive. Five alpha legionnaires and the Changeling walked from the depths of the mastodon. Each Alpha legionnaire was wearing the colours of the deathwatch and now carried the weaponry that had once belonged to those that had been killed. The changeling looked over the inquisitor before assuming his form, Susurri handing him the signet ring as he did so. The Changeling slipped the ring onto his finger. A second Aquila lander settled down on the landing pad. The Changeling wearing the Inquisitors form nods. The group runs off towards the lander as Susurri finishes clamping Virgil into the metal crucifix that would hold him in place for Flense to work on him. Dragging his captive back into the Mastodons belly once he had finished. A very brutal game where the imperial forces killed 138 cultists and 5 legion recon marines, and like the test results we had during testing it was very close. Capturing the inquisitor earned the chaos forces 2 points of chaos. Playing 40K to a narrative/campaign is always a lot of fun. It’s what the game is truly meant for in my opinion. The game has such a rich history and story to it that campaigns are perfect. Plus, I just like the more mellow approach to gaming in 40K this way where you try and tell a story, not dominate your opponent. True enough. Narrative games always bring you the best side of 40k. This campaign was the result of our previous efforts and evolved when the group all pooled our ideas together. Since we started the campaign though GW announced 8th edition, so now this will our Farewell 7th campaign. 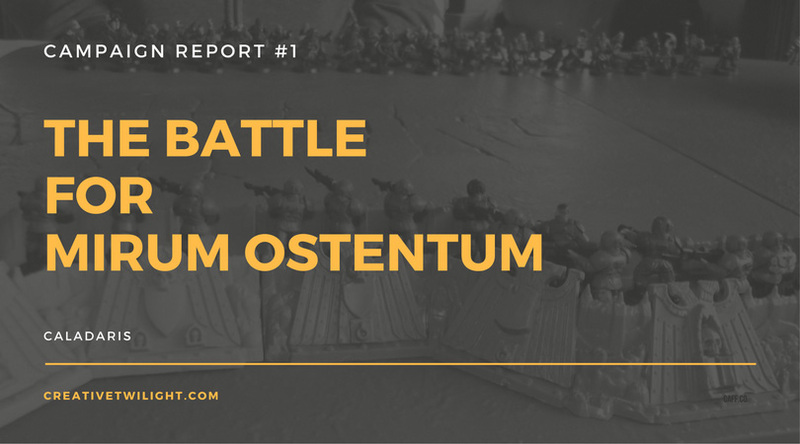 Phase 1 is all small scale skirmishes with fixed forces and defined objectives (8 missions). Phases 2-3 are mission tree affairs with distinct missions [Including one about setting fire to a city] and we end with a big apocalypse game (7 missions + 1 apocalypse game 40-50k a side imperials vs chaos). I’ll cover them in detail as we play them and I write them up. Those poor stupid cultists. Charging onwards! How was it to play? Mad, crazy and very close while still being fun. I have played 40k since models came in sleeved boxes. I now prefer to play other games such as Battlefleet gothic, AVP and 30k.